Nothing like a sniper to teach one gun safety. 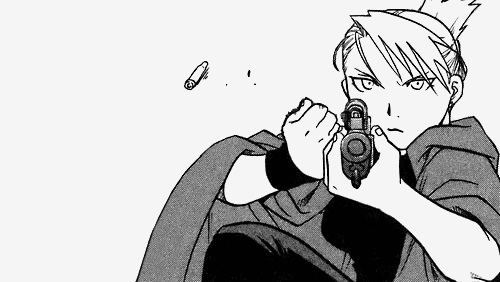 Riza Hawkeye, from Fullmetal Alchemist by Arakawa Hiromu. Would you feel comfortable with someone waving around a gun they do not know is loaded? How do you feel about someone who is not a marksman doing trick shooting? No, this is not a post about Gun Control or Firearm Safety, it is a post about writing. No one in their right mind will deny the fact that stories humans tell have patterns. Some of these patterns, over time, become so common that they earn the title of “trope” or “cliché.” You know some of them by sight, having seen them again and again. New ones appear every so often, Sometimes old ones go out of fashion, and sometimes they return and, for a little while, seem new again. Sometimes “new” tropes and clichés are actually old ones in disguise. A trope can be a cliché, but not every trope has to be. “Cliché” is what happens when that loaded trope misfires and a character, scene, or entire story dies to the reader’s interest because of it. I know you know the feeling. That moment, in a movie, where that thing that always happens, happens and you groan inside. For that moment in the story, if not for the whole of it, the writers have lost you. You are back in reality and rolling your eyes at the choices made in creating the film. The story lies bleeding. Maybe it’s just a fleshwound. Maybe it is fatal. Either way, it could have been avoided. So the question becomes: How can we, as writers, practice acceptable trope-safety? We are all inundated with tropes. Whether they would arise from our minds independently, or whether we are simply fed them from early childhood, they are in us. Chances are the first thoughts coming out of your head when you sit down to write, are tropes. In order to avoid any unpleasantness later on, you need to learn to recognize them, see them for what they are. I am of the opinion that tropes are neither good nor bad. I know people who struggle to avoid them altogether. The truth is, that is a trope in itself and often creates meaningless mush. Tropes exist, and continue to exist, because they serve purposes, and often serve them well. Fearing them is counter-productive. You will never be able to write anything meaningful by avoiding them completely. If you don’t believe me, spend some time wandering around tvtropes.org*. There is a trope for everything. *Warning. This website will eat your time like a huge time-eating sarlacc. So we cannot avoid tropes. What, then, should we do with them to prevent accidental story mutilation? Before a firearm can be either safely used, or safely discarded (whatever your preference) the person who has it must know what it is and think about what they want to do with it. The key is education and thought. Learn to recognize tropes, decide not to fear them, and then be deliberate in how you use them. The difference between effective use of a trope and a trope-turned-cliché can be very slight. This sounds vague, I know, but I cannot tell anyone how to use tropes because there are so many and I have no idea how any writer, other than myself, wants to use them. I think there are a few strategies, though. a. Turn the trope a little. Don’t change it entirely, but tweak it (and make sure you know if the tweaked trope is also trope). Think of this like a feint. Your audience gets something just different enough from what they expected to cause them to look at it more closely. b. Flip it. This one is pretty common, so be careful. It is usually referred to as an inverted trope. Princess saves knight can work quite well, but inverted tropes are tropes, too, and can become cliché or, worse, feel forced. c. Play it straight. Be very intentional. Know what you are doing, and have a good reason why. It is a little safer to do with with less-common tropes, but sometimes it’s fun to go with the “well-worn.” Just try to avoid doing this by accident because purposeless tropes easily become boring or even annoying. d. Subvert it. If there is a trope you really don’t like, consider using it to make a point against itself. This is the ultimate bait-and-switch of storytelling. I don’t particularly like this strategy, though it is sometimes very effective. Just be careful not to make war on straw. e. Leave it. If the story will work just as well if you abandon the trope, or move to a less-expected one, then maybe you should do that. While tropes can be fundamental to plot or character, often times they are just trappings. Trappings can matter a lot, but not all are of equal worth. f. Beware the implications of your tropes. This isn’t so much a strategy as very good advice. If you write about a Manic Pixie Dream Girl, make sure you don’t miss the problematic undercurrents. Whether you play them straight or subvert them, being unaware of them can undermine whatever story you are trying to tell. Ultimately, this post is me working through these questions for myself. I value input, and if this post has helped make you more aware of tropes, or helped you see new ways of dealing with them, then I am glad. Many times have I seen a perfectly good story or character fall prey to careless trope-use. If I can see it less in my own work, and less in the work of others, I will be very happy. Do your part to reduce story mortality! She’s awesome with handguns, too. 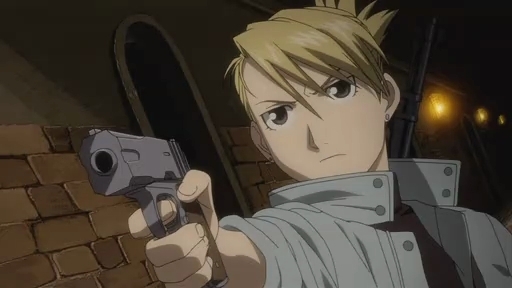 Riza Hawkeye from the anime “Fullmetal Alchemist: Brotherhood”, adapted from the Fullmetal Alchemist manga by Arakawa Hiromu.